Tokyo, an example of an urban heat island. 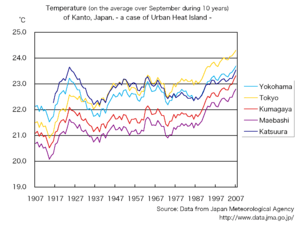 Normal temperatures of Tokyo go up more than those of the surrounding area. An urban heat island (UHI) is a city or metropolitan area that is significantly warmer than its surrounding rural areas due to human activities. The temperature difference usually is larger at night than during the day, and is most apparent when winds are weak. UHI is most noticeable during the summer and winter. The main cause of the urban heat island effect is from the modification of land surfaces. Waste heat generated by energy usage is a secondary contributor. As a population center grows, it tends to expand its area and increase its average temperature. The less-used term heat island refers to any area, populated or not, which is consistently hotter than the surrounding area. There are concerns raised about possible contribution from urban heat islands to global warming. Research on China and India indicates that urban heat island effect contributes to climate warming by about 30%. On the other hand, one 1999 comparison between urban and rural areas proposed that the urban heat island effects have little influence on global mean temperature trends. Many studies reveal increases in the severity of the effect with the progress of climate change. There are several causes of an urban heat island (UHI); for example, dark surfaces absorb significantly more solar radiation, which causes urban concentrations of roads and buildings to heat more than suburban and rural areas during the day; materials commonly used in urban areas for pavement and roofs, such as concrete and asphalt, have significantly different thermal bulk properties (including heat capacity and thermal conductivity) and surface radiative properties (albedo and emissivity) than the surrounding rural areas. This causes a change in the energy budget of the urban area, often leading to higher temperatures than surrounding rural areas. Another major reason is the lack of evapotranspiration (for example, through lack of vegetation) in urban areas. With a decreased amount of vegetation, cities also lose the shade and cooling effect of trees, and the removal of carbon dioxide. Other causes of a UHI are due to geometric effects. The tall buildings within many urban areas provide multiple surfaces for the reflection and absorption of sunlight, increasing the efficiency with which urban areas are heated. This is called the "urban canyon effect". Another effect of buildings is the blocking of wind, which also inhibits cooling by convection and prevents pollution from dissipating. Waste heat from automobiles, air conditioning, industry, and other sources also contributes to the UHI. High levels of pollution in urban areas can also increase the UHI, as many forms of pollution change the radiative properties of the atmosphere. As UHI raises the temperature of cities, it also increases the concentration of ozone, a greenhouse gas whose production accelerates with an increase in temperature. Throughout the daytime, particularly when the skies are free of clouds, urban surfaces are warmed by the absorption of solar radiation. Surfaces in the urban areas tend to warm faster than those of the surrounding rural areas. By virtue of their high heat capacities, urban surfaces act as a giant reservoir of heat energy. For example, concrete can hold roughly 2,000 times as much heat as an equivalent volume of air. As a result, the large daytime surface temperature within the UHI is easily seen via thermal remote sensing. As is often the case with daytime heating, this warming also has the effect of generating convective winds within the urban boundary layer. It is theorized that, due to the atmospheric mixing that results, the air temperature perturbation within the UHI is generally minimal or nonexistent during the day, though the surface temperatures can reach extremely high levels. At night, the situation reverses. The absence of solar heating causes the atmospheric convection to decrease, and the urban boundary layer begins to stabilize. If enough stabilization occurs, an inversion layer is formed. This traps urban air near the surface, and keeping surface air warm from the still-warm urban surfaces, forming the nighttime warmer air temperatures within the UHI. Other than the heat retention properties of urban areas, the nighttime maximum in urban canyons could also be due to the blocking of "sky view" during cooling: surfaces lose heat at night principally by radiation to the comparatively cool sky, and this is blocked by the buildings in an urban area. Radiative cooling is more dominant when wind speed is low and the sky is cloudless, and indeed the UHI is found to be largest at night in these conditions. If a city or town has a good system of taking weather observations the UHI can be measured directly. An alternative is to use a complex simulation of the location to calculate the UHI, or to use an approximate empirical method Such models than allow the UHI to be included in estimates of future temperatures rises within cities due to climate change. Professor Leonard O. Myrup, University of California at Davis, developed and published in 1969 the first comprehensive numerical treatment to predict the effects of the urban heat island (UHI). His paper published in the American Meteorological Society's Journal of Applied Meteorology surveys UHI and criticizes then-existing theories as being excessively qualitative. A general purpose, numerical energy budget model is described and applied to the urban atmosphere. Calculations for several special cases as well as a sensitivity analysis are presented. The model is found to predict the correct order of magnitude of the urban temperature excess. The heat island effect is found to be the net result of several competing physical processes. In general, reduced evaporation in the city center and the thermal properties of the city building and paving materials are the dominant parameters. It is suggested that such a model could be used in engineering calculations to improve the climate of existing and future cities. Species that are good at colonizing can utilize conditions provided by urban heat islands to thrive in regions outside of their normal range. Examples of this include grey-headed flying fox (Pteropus poliocephalus) and the common house gecko (Hemidactylus frenatus). Grey-headed flying foxes, found in Melbourne Australia, colonized urban habitats following increase in temperatures there. Increased temperatures, causing warmer winter conditions, made the city more similar in climate to the more northerly wildland habitat of the species. Urban heat islands caused by cities have altered the natural selection process. Selective pressures like temporal variation in food, predation and water are relaxed causing for a new set of selective forces to roll out. For example, within urban habitats, insects are more abundant than in rural areas. Insects are ectotherms. This means that they depend on the temperature of the environment to control their body temperature, making for the warmer climates of the city perfect for their ability to thrive. A study done in Raleigh North Carolina conducted on Parthenolecanium quercifex (oak scales), showed that this particular species preferred warmer climates and were therefore found in higher abundance in the urban habitats than on oak trees in rural habitats. Over time of living in urban habitats, they have adapted to thrive in warmer climates than in cooler. Research in the United States suggests that the relationship between extreme temperature and mortality varies by location. Heat is more likely to increase the risk of mortality in cities at mid-latitudes and high latitudes with significant annual temperature variation. For example, when Chicago, New York and Philadelphia experience unusually hot summertime temperatures, elevated levels of illness and death are predicted. In contrast, parts of the country that are mild to hot year-round have a lower public health risk from excessive heat. Research shows that residents of southern cities, such as Los Angeles, Phoenix, and Miami, tend to be acclimated to hot weather conditions and therefore less vulnerable to heat related deaths; however, the high humidity of large southern cities such as Atlanta, Dallas, Houston, Nashville and New Orleans lead to deadly conditions when temperatures rise above normal. Increased temperatures have been reported to cause heat stroke, heat exhaustion, heat syncope, and heat cramps. Some studies have also looked at how severe heat stroke can lead to permanent damage to organ systems. This damage can increase the risk of early mortality because the damage can cause severe impairment in organ function. Other complications of heat stroke include respiratory distress syndrome in adults and disseminated intravascular coagulation. Some researchers have noted that any compromise to the human body's ability to thermoregulate would in theory increase risk of mortality. This includes illnesses that may affect a person's mobility, awareness, or behavior. Researchers have noted that individuals with cognitive health issues (e.g. depression, dementia, Parkinson's disease) are more at risk when faced with high temperatures and "need to take extra care" as cognitive performance has been shown to be differentially affected by heat. People with diabetes, are overweight, have sleep deprivation, or have cardiovascular/cerebrovascular conditions should avoid too much heat exposure. Some common medications that have an effect on thermoregulation can also increase the risk of mortality. Specific examples include anticholinergics, diuretics, phenotiazines and barbiturates. Not only health, but heat can also affect behavior. A U.S. study suggests that heat can make people more irritable and aggressive, noting that violent crimes increased by 4.58 out of 100,000 for every one degree increase in temperature. The Centers for Disease Control and Prevention notes that it "is difficult to make valid projections of heat-related illness and death under varying climate change scenarios" and that "heat–related deaths are preventable, as evidenced by the decline of all-cause mortality during heat events over the past 35 years". However, some studies suggest the possibility that health impacts from UHIs are disproportionate because the impacts can be unevenly distributed based on a variety of factors (e.g. age, ethnicity and socioeconomic status). This raises the possibility of health impacts from UHIs being an environmental justice issue. In recent years, researchers have discovered a strong correlation between neighborhood income and tree canopy cover. In 2010, researchers at Auburn University and University of Southern California found that the presence of trees are "highly responsive to changes in [neighborhood] income." Low-income neighborhoods tend to have significantly less trees than neighborhoods with higher incomes. They described this unequal distribution of trees as a demand for "luxury," rather than "necessity." According to the study, "for every 1 percent increase in per capita income, demand for forest cover increased by 1.76 percent. But when income dropped by the same amount, demand decreased by 1.26 percent." Trees are a necessary feature in combating the urban heat island effect because they reduce air temperatures by 10 °F or 5.5 °C, and surface temperatures by up to 20-45 °F or 11-25 °C. Researchers hypothesized that less-well-off neighborhoods do not have the financial resources to plant and maintain trees. Affluent neighborhoods can afford more trees, on "both public and private property." Part of this is also that wealthier homeowners and communities can afford more land, which can be kept open as green space, whereas poorer ones are often rentals, where landowners try to maximize their profit by putting as much density as possible on their land. UHIs also impair water quality. Hot pavement and rooftop surfaces transfer their excess heat to stormwater, which then drains into storm sewers and raises water temperatures as it is released into streams, rivers, ponds, and lakes. Additionally, increased urban water body temperatures lead to a decrease in diversity in the water. In August 2001, rains over Cedar Rapids, Iowa led to a 10.5C (18.9F) rise in the nearby stream within one hour, which led to a fish kill. Since the temperature of the rain was comparatively cool, it could be attributed to the hot pavement of the city. Similar events have been documented across the American Midwest, as well as Oregon and California. Rapid temperature changes can be stressful to aquatic ecosystems. Permeable pavements may mitigate these effects by percolating water through the pavement into subsurface storage areas where it can be dissipate through absorption and evaporation. The city of Visalia, California has implemented a street tree ordinance intended to promote and regulate the planting, maintenance, and protection of street trees within the city. Their ordinance does not allow street trees to be altered, pruned or removed. Street trees are also protected during construction. In Capital E Analysis' conclusions of the financial benefits of green buildings, it was determined that green roofs successfully lowered energy usage and raised health benefits. For every square foot of green roof used in one study the savings amounted to $5.80 energy-wise. There were also savings seen in the emissions, water, and maintenance categories. Overall, the savings amounted to $52.90-$71.30 on average while the cost of going green totaled -$3.00-$5.00. 1 2 Solecki, William D.; Rosenzweig, Cynthia; Parshall, Lily; Pope, Greg; Clark, Maria; Cox, Jennifer; Wiencke, Mary (2005). "Mitigation of the heat island effect in urban New Jersey". Global Environmental Change Part B: Environmental Hazards. 6 (1): 39–49. doi:10.1016/j.hazards.2004.12.002. 1 2 Li, Y.; Zhao, X. (2012). "An empirical study of the impact of human activity on long-term temperature change in China: A perspective from energy consumption". Journal of Geophysical Research. 117. Bibcode:2012JGRD..11717117L. doi:10.1029/2012JD018132. ↑ Huang, Q., & Lu, Y. (2015). The Effect of Urban Heat Island on Climate Warming in the Yangtze River Delta Urban Agglomeration in China. International Journal of Environmental Research and Public Health, 12(8), 8773-8789. ↑ Ren, Y., Parker, D., Ren, G., & Dunn, R. (2015). Tempo-spatial characteristics of sub-daily temperature trends in mainland China. Climate Dynamics, 1-12. ↑ Joshi, R., Raval, H., Pathak, M., Prajapati, S., Patel, A., Singh, V., & Kalubarme, M. H. (2015). Urban Heat Island Characterization and Isotherm Mapping Using Geo-Informatics Technology in Ahmedabad City, Gujarat State, India. International Journal of Geosciences, 6(03), 274. ↑ Peterson, T.C. ; Gallo, K.P. ; Lawrimore, J.; Owen, T.W. ; Huang, A.; McKittrick, D.A. (1999). "Global rural temperature trends". Geophysical Research Letters. 26 (3): 329–332. Bibcode:1999GeoRL..26..329P. doi:10.1029/1998GL900322. ↑ Sachindra, D. A., Ng, A. W. M., Muthukumaran, S., & Perera, B. J. C. (2015). Impact of Climate Change on Urban Heat Island Effect and Extreme Temperatures: A Case Study. Quarterly Journal of the Royal Meteorological Society..
1 2 T. R. Oke (1982). "The energetic basis of the urban heat island". Quarterly Journal of the Royal Meteorological Society. 108 (455): 1–24. Bibcode:1982QJRMS.108....1O. doi:10.1002/qj.49710845502. ↑ Santos, Fabiane. Trees – the Natural Air Conditioners. Scientific Scribbles. The University of Melbourne, 23 Aug. 2013. Web. 27 Sept. 2013. <http://blogs.unimelb.edu.au/sciencecommunication/2013/08/23/trees-the-natural-air-conditioners/>. ↑ United States. NASA. Air Pollution Prevention Through Urban Heat Island Mitigation: An Update on the Urban Heat Island Pilot Project. By Virginia Gorsevski, Haider Taha, Dale Quattrochi, and Jeff Luvall. N.p. : n.p., n.d. Print. ↑ Sailor, D. J. (2011). "A review of methods for estimating anthropogenic heat and moisture emissions in the urban environment". International Journal of Climatology. 31 (2): 189–199. doi:10.1002/joc.2106. ↑ Chen, F.; Kusaka, H.; Bornstein, R.; Ching, J.; Grimmond, C. S. B.; Grossman-Clarke, S.; Loridan, T.; Manning, K. W.; Martilli, A.; Miao, S.; Sailor, D.; Salamanca, F. P.; Taha, H.; Tewari, M.; Wang, X.; Wyszogrodzki, A. A.; Zhang, C. (2011). "The integrated WRF/urban modelling system: Development, evaluation, and applications to urban environmental problems". International Journal of Climatology. 31 (2): 273. doi:10.1002/joc.2158. ↑ Union of Concerned Scientists. "Rising Temperatures, Worsening Ozone Pollution." Climate Change and Your Health (2011): n. pag. Print. ↑ Imyunku (2009). "Learning About Urban Heat Islands". Pusan National University. Retrieved 2009-06-18. ↑ Hinkel, Kenneth M. (March 2003). "Barrow Urban Heat Island Study". Department of Geography, University of Cincinnati. Retrieved 2007-08-02. ↑ United States. Environmental Protection Agency. Heat Island Effect. By EPA. N.p., 29 August 2013. Web. 31 August 2015. <http://www.epa.gov/heatisld/about/index.htm>. 1 2 3 IPCC (2001). "Climate Change 2001: The Scientific Basis. Chapter 2.2 How Much is the World Warming?". Retrieved 2009-06-18. ↑ M. Carmen Moreno-garcia (1993-10-28). "Intensity and form of the urban heat island in barcelona". International Journal of Climatology. 14 (6): 705–710. Bibcode:1994IJCli..14..705M. doi:10.1002/joc.3370140609. ↑ Keith C. Heidorn (2009). "Luke Howard: The Man Who Named The Clouds". Islandnet.com. Retrieved 2009-06-18. ↑ M. Roth; T. R. Oke & W. J. Emery (1989). "Satellite-derived urban heat islands from three coastal cities and the utilization of such data in urban climatology". International Journal of Remote Sensing. 10 (11): 1699–1720. Bibcode:1989IJRS...10.1699R. doi:10.1080/01431168908904002. ↑ H.-Y. Lee (1993). "An application of NOAA AVHRR thermal data to the study or urban heat islands". Atmospheric Environment. 27B: 1–13. Bibcode:1993AtmEB..27....1L. doi:10.1016/0957-1272(93)90041-4. ↑ I. Camilloni & V. Barros (1997). "On the urban heat island effect dependence on temperature trends". Climatic Change. 37 (4): 665–681. doi:10.1023/A:1005341523032. ↑ C.J.G. (Jon) Morris (2006-07-09). 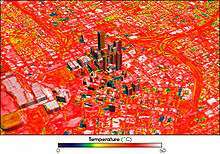 "Urban Heat Islands and Climate Change - Melbourne, Australia". University of Melbourne, Victoria, Australia. Archived from the original on March 10, 2009. Retrieved 2009-06-18. ↑ Kershaw, T. J.; Sanderson, M.; Coley, D.; Eames, M. (2010). "Estimation of the urban heat island for UK climate change projections". Building Services Engineering Research and Technology. 31 (3): 251–263. doi:10.1177/0143624410365033. ↑ "A Numerical Model of the Urban Heat Island". Journal of Applied Meteorology. 8: 908–918. Bibcode:1969JApMe...8..908M. doi:10.1175/1520-0450(1969)008<0908:ANMOTU>2.0.CO;2. ↑ Shochat, Eyal; Warren, Paige S.; Faeth, Stanley H.; Mclntyre, Nancy E.; Hope, Diane (April 2006). "From Patterns to Emerging Processes in Mechanistic Urban Ecology". Trends in Ecology and Evolution. 21: 3. doi:10.1016/j.tree.2005.11.019. ↑ Shochat, Eyal; Warren, Paige S.; Faeth, Stanley H.; Mclntyre, Nancy E.; Hope, Diane (April 2006). "From Patterns to Emerging Processes in Mechanistic Urban Ecology". TRENDS in Ecology and Evolution. 21: 3. ↑ "Islands in the Sun". Institute on the Environment. University of Minnesota. ↑ Shochat, Eyal; Warren, Paige S.; Faeth, Stanley H.; Mclntyre, Nancy E.; Hope, Diane (April 2006). "From Patterns to Emerging Processes in Mechanistic Urban Ecology". TRENDS in Ecology and Evolution. 21: 4. ↑ Tang, Teri. "Where are the Insects?". School of Life Sciences. Arizona State University. Retrieved 19 October 2014. ↑ McDonnell, Mark J. (1997). "Ecosystem processes along an urban-to-rural gradient". Urban ecosystems. 1: 26. ↑ Arizona Board of Regents (2006). "Urban Climate – Climate Study and UHI via the Internet Wayback Machine". Arizona State University. Retrieved 2007-08-02. ↑ Chiel C. van Heerwaarden & J. Vilà-Guerau de Arellano (2008). "Relative humidity as an indicator for cloud formation over heterogeneous land surfaces". Journal of the Atmospheric Sciences. 65 (10): 3263–3277. Bibcode:2008JAtS...65.3263V. doi:10.1175/2008JAS2591.1. ↑ Fuchs, Dale (2005-06-28). "Spain goes hi-tech to beat drought". The Guardian. Retrieved 2007-08-02. ↑ Goddard Space Flight Center (2002-06-18). "NASA Satellite Confirms Urban Heat Islands Increase Rainfall Around Cities". National Aeronautics and Space Administration. Archived from the original on June 12, 2008. Retrieved 2009-07-17. ↑ "Myths and Misconceptions about Tornadoes". Tornado Project. 1999. Retrieved 2008-06-24. ↑ Gretchen Cook-Anderson (2004-06-29). "Urban Heat Islands Make Cities Greener". NASA. Retrieved 2007-08-02. ↑ S. A. Changnon, Jr.; K. E. Kunkel & B. C. Reinke (1996). "Impacts and responses to the 1995 heat wave: A call to action". Bulletin of the American Meteorological Society. 77 (7): 1497–1506. Bibcode:1996BAMS...77.1497C. doi:10.1175/1520-0477(1996)077<1497:IARTTH>2.0.CO;2. ↑ R. W. Buechley; J. Van Bruggen & L. E. Trippi (1972). "Heat island = death island?". Environmental Research. 5 (1): 85–92. Bibcode:1972ER......5...85B. doi:10.1016/0013-9351(72)90022-9. PMID 5032927. ↑ J. F. Clarke (1972). "Some effects of the urban structure on heat mortality". Environmental Research. 5 (1): 93–104. Bibcode:1972ER......5...93C. doi:10.1016/0013-9351(72)90023-0. PMID 5032928. ↑ Robert E. Davis; Paul C. Knappenberger; Patrick J. Michaels & Wendy M. Novicoff (November 2003). "Changing heat-related mortality in the United States". Environmental Health Perspectives. 111 (14): 1712–1718. doi:10.1289/ehp.6336. PMC 1241712 . PMID 14594620. 1 2 3 4 5 6 7 8 9 10 Kovats, R. Sari; Hajat, Shakoor (April 2008). "Heat Stress and Public Health: A Critical Review". Annual Review of Public Health. 29 (1): 41–55. doi:10.1146/annurev.publhealth.29.020907.090843. 1 2 3 4 5 6 7 8 9 Koppe, Christina; Sari Kovats; Gerd Jendritzky; Bettina Menne (2004). "Heat-waves: risks and responses". Health and Global Environmental Change Series. 2. ↑ Hancock, P. A.; Vasmatzidis, I. (January 2003). "Research Article". International Journal of Hyperthermia. 19 (3): 355–372. doi:10.1080/0265673021000054630. 1 2 3 4 5 "Assessment of International Urban Heat Island Research" (PDF). U.S. Department of Energy Report. Navigant Consulting. Retrieved 30 April 2014. ↑ "Heat-Related Morbidity and Mortality". U.S. Center for Disease Control. USA Government. Retrieved 30 April 2014. ↑ Díaz, J.; Jordán, A.; García, R.; López, C.; Alberdi, J.; Hernández, E.; Otero, A. (1 February 2014). "Heat waves in Madrid 1986–1997: effects on the health of the elderly". International Archives of Occupational and Environmental Health. 75 (3): 163–170. doi:10.1007/s00420-001-0290-4. ↑ Harlan, Sharon L.; Brazel, Anthony J.; Prashad, Lela; Stefanov, William L.; Larsen, Larissa (December 2006). "Neighborhood microclimates and vulnerability to heat stress". Social Science & Medicine. 63 (11): 2847–2863. doi:10.1016/j.socscimed.2006.07.030. ↑ Zhu, Pengyu; Zhang Yaoqui. "Demand for Urban Forests in United States Cities". Landscape and Urban Planning. 84: 293–300. doi:10.1016/j.landurbplan.2007.09.005. Retrieved 7 May 2014. 1 2 De Chant, Tim. "Urban Trees Reveal Income Inequality". Per Square Mile. Retrieved 7 May 2014. ↑ "Save Mount Sutro Forest". Retrieved 22 July 2016. ↑ NYS DEC. "Streams Tributary to Onondaga Lake Biological Assessment." Dec.ny.gov. N.p., 2008. Web. 12 September 2013. ↑ Paul A. Tipler & Gene Mosca (2007). Physics for Scientists and Engineers. Macmillan. p. 686. ISBN 978-1-4292-0124-7. Retrieved 2011-01-14. ↑ "Urban Climate – Climate Study and UHI". United States Environmental Protection Agency. 2009-02-09. Retrieved 2009-06-18. ↑ "Cool Pavement Report" (PDF). Environmental Protection Agency. June 2005. pp. 21, 43. Retrieved 2013-01-15. ↑ Sheng-chieh Chang (2000-06-23). "Energy Use". Environmental Energies Technology Division. Archived from the original on March 11, 2009. Retrieved 2009-06-18. ↑ "Aging and Weathering of Cool Roofing Membranes" (PDF). Cool Roofing Symposium. 2005-08-23. Retrieved 2010-08-16. ↑ Albers, R. A. W., Bosch, P. R., Blocken, B., Van Den Dobbelsteen, A. A. J. F., Van Hove, L. W. A., Spit, T. J. M., ... & Rovers, V. (2015). Overview of challenges and achievements in the Climate Adaptation of Cities and in the Climate Proof Cities program. Building and environment, 83, 1-10. ↑ "Comprehensive Cool Roof Guide from the Vinyl Roofing Division of the Chemical Fabrics and Film Association". ↑ "Cool Pavement Report" (PDF). Environmental Protection Agency. June 2005. p. 14. Retrieved 2009-02-06. ↑ Al Gore; A. Steffen (2008). World Changing: A User's Guide for the 21st Century. New York: Abrams. p. 258. ↑ "Green (Planted) Roofs". Retrieved 2010-08-07. ↑ New York City Regional Heat Island Initiative (October 2006). "Mitigating New York City's Heat Island With Urban Forestry, Living Roofs, and Light Surfaces" (PDF). New York State Energy Research and Development Authority. p. ii. Retrieved 2009-06-18. ↑ Arthur Rosenfeld; Joseph Romm; Hashem Akbari; Alana Lloyd (February–March 1997). "Painting the Town White – and Green". MIT Technology Review. Archived from the original on 2007-07-14. Retrieved 2007-09-29. 1 2 3 4 5 Zinzi, M., and S. Agnoli. "Cool and green roofs. An energy and comfort comparison between passive cooling and mitigation urban heat island techniques for residential buildings in the Mediterranean region." Energy and Buildings. 55. (2012): 66-76. Print. ↑ AB 32 Scoping Plan." Scoping Plan. N.p., n.d. Web. 06 Apr. 2014. <http://www.arb.ca.gov/cc/scopingplan/scopingplan.htm>. ↑ "California's Advanced Clean Cars Program." Advanced Clean Cars. N.p., n.d. Web. 06 Apr. 2014. <http://www.arb.ca.gov/msprog/consumer_info/advanced_clean_cars/consumer_acc.htm>. ↑ "California Renewables Portfolio Standard (RPS)." California Publics Utilities Commission. N.p., n.d. Web. 06 Apr. 2014. <http://www.cpuc.ca.gov/PUC/energy/Renewables/>. ↑ "Low Carbon Fuel Standard." Low Carbon Fuel Standard. N.p., n.d. Web. 06 Apr. 2014. <http://www.energy.ca.gov/low_carbon_fuel_standard/>. ↑ "Cap-and-Trade Program." Air Resources Board. N.p., n.d. Web. 06 Apr. 2014. <http://www.arb.ca.gov/cc/capandtrade/capandtrade.htm>. 1 2 "Reducing Urban Heat Islands: Compendium of Strategies | Heat Island Effect | US EPA." EPA. Environmental Protection Agency, n.d. Web. 16 Apr. 2014. <http://www.epa.gov/heatisland/resources/pdf/ActivitiesCompendium.pdf>. ↑ "Roadmap for Incorporating Energy Efficiency/Renewable Energy Policies and Programs into State and Tribal Implementation Plans." US EPA." EPA. Environmental Protection Agency, July 2012 n.d. Web. 15 Apr. 2014. ↑ "Reducing Urban Heat Islands: Compendium of Strategies | Heat Island Effect | US EPA." EPA. Environmental Protection Agency, n.d. Web. 06 Apr. 2014. <http://www.epa.gov/heatisland/resources/compendium.htm>. ↑ "SMUD." SMUD Video Player. N.p., n.d. Web. 06 Apr. 2014. <https://www.smud.org/en/video/cc-single-rebranded.html?bclid=38536226001&bctid=20363808001>. ↑ Ecoroof Incentive Program." Live Green Toronto, n.d. Web. <http://www.greenroofs.org/resources/EcoRoofBrochure_Email_2013.pdf>. 1 2 "TreeVitalize." TreeVitalize. N.p., n.d. Web. 06 Apr. 2014. ↑ "About." TreeUtah. N.p., n.d. Web. 06 Apr. 2014. ↑ "Global Systems Science." Global Systems Science. N.p., 2012. Web. 06 Apr. 2014. ↑ "Indigenous Tree Program." City of Glendale, CA :. N.p., n.d. Web. 06 Apr. 2014. <http://www.glendaleca.gov/government/city-departments/public-works/indigenous-tree-program>. ↑ "Tree Protection Program - City of Berkeley, CA." Planning and Development-City of Berkeley, CA. N.p., n.d. Web. 06 Apr. 2014. <http://www.ci.berkeley.ca.us/Planning_and_Development/Home/Tree_Protection_Program.aspx>. ↑ "City of Visalia - Street Tree Ordinance." Street Tree Ordinance. N.p., n.d. Web. 06 Apr. 2014. <http://www.ci.visalia.ca.us/depts/parks_n_recreation/urban_forestry/street_tree_ordinance.asp>. ↑ Maller, C. "Healthy Nature Healthy People: 'contact with Nature' as an Upstream Health Promotion Intervention for Populations." Health Promotion International 21.1 (2005): 45-54. Print. ↑ Ulrich, R. "View through a Window May Influence Recovery from Surgery." Science 224.4647 (1984): 420-21. Print. ↑ Wilmsen, Carl. Partnerships for Empowerment: Participatory Research for Community-based Natural Resource Management. London: Earthscan, 2008. Print. 1 2 Dunnett, Nigel. Small Green Roofs: Low-tech Options for Greener Living. Portland, Or. : Timber, 2011. Print. ↑ McPherson, Gregory, James Simpson, Paula Peper, Shelley Gardner, Kelaine Vargas, Scott Maco, and Qingfu Xiao. "Coastal Plain Community Tree Guide: Benefits, Costs, and Strategic Planting". USDA, Forest Service, Pacific Southwest Research Station. (2006). Web. ↑ "Voluntary Green Building Programs". ↑ "LEED 2009 for New Construction and Major Renovations Rating System". US Green Building Council. November 2008. Retrieved 2010-08-17. ↑ "Green Globes". Retrieved 2011-07-27. 1 2 Rosenfeld, Arthur H., et al. "Cool communities: strategies for heat island mitigation and smog reduction." Energy and Buildings 28.1 (1998): 51-62. ↑ Carter, Timothy, and Andrew Keeler. "Life-cycle cost–benefit analysis of extensive vegetated roof systems." Journal of environmental management 87.3 (2008): 350-363. ↑ Kats, Gregory. Green building costs and financial benefits. Boston, MA: Massachusetts Technology Collaborative, 2003. ↑ T. C. Peterson (2003). "Assessment of Urban Versus Rural In Situ Surface Temperatures in the Contiguous United States: No Difference Found" (PDF). Journal of Climate. 16 (18): 2941–2959. Bibcode:2003JCli...16.2941P. doi:10.1175/1520-0442(2003)016<2941:AOUVRI>2.0.CO;2. ↑ J. Hansen; R. Ruedy; M. Sato; M. Imhoff; W. Lawrence; D. Easterling; T. Peterson & T. Karl (2001). "A closer look at United States and global surface temperature change". Journal of Geophysical Research. 106: 239–247. Bibcode:2001JGR...10623947H. doi:10.1029/2001JD000354. ↑ D. E. Parker (2004). "Climate: Large-scale warming is not urban". Nature. 432 (7015): 290. Bibcode:2004Natur.432..290P. doi:10.1038/432290a. PMID 15549087. ↑ David E. Parker (2006). "A demonstration that large-scale warming is not urban". Journal of Climate. 19 (12): 2882–2895. Bibcode:2006JCli...19.2882P. doi:10.1175/JCLI3730.1. ↑ Parker, David E. (2004). "Large-scale warming is not urban" (PDF). Nature. 432 (7015): 290–290. Bibcode:2004Natur.432..290P. doi:10.1038/432290a. PMID 15549087. Archived from the original (PDF) on September 28, 2007. Retrieved 2007-08-02. 1 2 Black, Richard (2004-11-18). "Climate change sceptics 'wrong'". BBC News. Retrieved 2007-08-02. ↑ Schmidt, G. A. (2009). "Spurious correlations between recent warming and indices of local economic activity". International Journal of Climatology. 29 (14): 2041–2048. Bibcode:2009IJCli..29.2041S. doi:10.1002/joc.1831. ↑ Ross McKitrick; Nicolas Nierenberg (2010-01-01). "Socioeconomic patterns in climate data". Journal of Economic and Social Measurement. 35 (3): 149–175. doi:10.3233/JEM-2010-0336. . Also see for a non-technical summary, and comments on the publication delay. ↑ Jeff Tollefson (2011-10-20). "Different method, same result: global warming is real". Nature News. doi:10.1038/news.2011.607. Retrieved 2011-10-22. ↑ "Cooling the Warming Debate: Major New Analysis Confirms That Global Warming Is Real". Science Daily. 2011-10-21. Retrieved 2011-10-22. ↑ Ian Sample (2011-10-20). "Global warming study finds no grounds for climate sceptics' concerns". The Guardian. Retrieved 2011-10-22. ↑ Richard Black (2011-10-21). "Global warming 'confirmed' by independent study". BBC News. Retrieved 2011-10-21. ↑ "Climate change: The heat is on". The Economist. 2011-10-22. Retrieved 2011-10-22. ↑ Kevin E. Trenberth; Philip D. Jones; Peter Ambenje; Roxana Bojariu; David Easterling; Albert Klein Tank; David Parker; Fatemeh Rahimzadeh; James A. Renwick; Matilde Rusticucci; Brian Soden & Panmao Zhai (2007). "IPCC Fourth Assessment Report - Chapter 3 - Observations: Surface and Atmospheric Climate Change" (PDF). Intergovernmental Panel on Climate Change. p. 244. Retrieved 2009-06-27. ↑ Georgescu, Matei; Morefield, Philip E.; Bierwagen, Britta G.; Weaver, Christopher P. (2014). "Urban Adaptation Can Roll Back Warming of Emerging Megapolitan Regions". Proceedings of the National Academy of Sciences of the United States of America. 111: 2909–2914. Bibcode:2014PNAS..111.2909G. doi:10.1073/pnas.1322280111. Lay summary – JournalistsResource.org. Helmut E. Landsberg (1981). The Urban Climate. New York: Academic Press. ISBN 0-12-435960-4. Wikimedia Commons has media related to Urban heat islands.